AP ECET 2019 Notification, Exam Date, Eligibility| Andhra Pradesh ECET 2019 Apply Online at sche.ap.gov.in/ECET : Online AP ECET 2019 Notification, Exam Date, Eligibility| Andhra Pradesh ECET 2019 Apply Online at sche.ap.gov.in/ECET. Online Andhra Pradesh ECET 2019Notification, Schedule. Jawaharlal Nehru Technological University, Kakinada issued the Andhra Pradesh State ECET 2019 Notification in March 2019 and this Engineering Common Entrance Test for Diploma Holders and B.Sc(Maths) Degree holders being conducted on behalf of APSCHE. 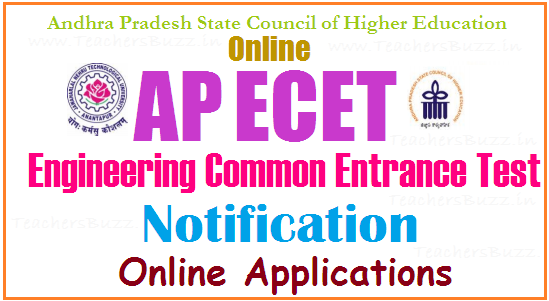 AP ECET 2019 Exam date, Notification, Online Application form, Eligibility, Fee, How to Apply, Important dates, Schedule, Exam pattern, Last date for apply online,entrance exam date, results-rank cards, hall tickets, counselling dates details and Other details given here. AP ECET [FDH & B.Sc. (Mathematics)]-2019 Notification by JNTU Ananthapuram: In accordance with G.O.Ms. No.57 Higher Education (EC.2) Dept. dated 12-5-2008 and amendments made later, AP Engineering Common Entrance Test (APECET-2019) will be conducted on 19-04-2019 from 10.00 AM to 1.00 PM for admission into 2nd year level Lateral Entry into Engineering/Pharmacy Courses for Diploma holders of Engineering & Technology and B.Sc. Candidates for the academic year 2019-20. Eligible candidates can submit their applications through online mode only, by paying the application registration and processing fee of Rs.550/- through AP Online Payment gateway (Credit Card/Debit Card or Net banking). The detailed information regarding eligibility, syllabus and model Question Paper, Mock Test, related instructions and procedure for Online Submission of Applications are available on the website https://sche.ap.gov.in/ecet. The candidates who are fulfilling the following eligibility conditions in respect to nationality and qualification can appear the AP ECET 2019. Candidate must be the Indian citizen. Must belong to the Andhra Pradesh state and satisfy the local/non local status. One should have passed 3-year B.Sc Degree with Mathematics from a recognized University of state or its equivalent. 2. Candidates who are appearing diploma course are also eligible for admission to B.E./ B.Tech/ B.Pharmacy courses provided they have completed prescribed practical training before admission. 3. Minimum marks required in Diploma in Engineering and Technology/ Pharmacy/ B.Sc Degree is 45% marks for unreserved category and 40% for reserved category candidates. The registration fee of Rs.550/- may be paid at AP Online Centres in AP and also through payment gateway (Credit/Debit Cards/Net Banking). Eligible candidates who wish to apply for ECET-2019 may submit their applications through ONLINE mode ONLY as per schedule (without late fee). Detailed information regarding Syllabi, List of courses, Procedure for Online Application with without late fee etc., is given in the detailed notification and "Instruction Booklet" displayed in the website apecet.org. Candidate has to fulfill the eligibility criteria laid down in the relevant G.Os at the time of admission. 4. Now click on the Fill Application link, a new webpage appear on the screen. 5. Enter the details in the respective fields completed after clicking the button Proceed to fill application form application will be displayed. 7. Fill the entire academic, study , reservation and personal details . Upload photo and signature and click Save button. 8. Finally click submit button,take the printout application mentioning the Reference Id.